You can’t beat the quality of Italian-made friction saws from MACC Machinery. This internationally renowned metal cutting saw brand is available right here in Australia thanks to our nationwide distribution centres. Click through to each of our friction saw product pages below to find full product details and to request a quote. Friction saws are high-speed circular saws where frictional heat is used to melt the material adjacent to it. The heat formed from the friction is sufficient enough to melt the metal, producing a very fast cut. Friction saws are specially designed for cutting the most difficult materials at high speed and are ideal for simple straight-line sawing or stock cut off. 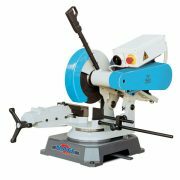 Circular friction saws are regularly used to cut structural steel shapes, products and structural beams. From thin tubes to hardened steel bars, a friction saw can do it all. Keep in mind that due to the high speed of these saws, the blades have a shorter life span compared to other metal saws. Our friction saws are industrial grade and suited for a large range of metal cutting jobs. We have two highly reliable friction saws available to purchase from MACC. The TV 350 is extra heavy-duty, featuring a swivel head and swivel vise which provides complete reverse-angle cutting. The quick locking vise keeps your work secure, the trigger switch operation makes it a breeze to use and the adjustable material stop is ideal for repetitive production. This model also includes an emergency stop safety switch to help you maintain safe work practices. The TV 400 is another highly desirable friction saw featuring a 400mm blade. This swivel head friction saw has all the same features as the 350 model but with greater cutting capacity and a larger blade. We also have optional saw stands as well as straight and V-shape roller stand, and roller conveyors from 1500mm to 3000mm in length. Visit each product page, read through the product brochure and learn about all the features and benefits each friction saw has to offer before deciding on which model you would like to purchase. Once you have made your decision, send us a quote enquiry online. If you have any further questions regarding delivery or product specifications, call us on (07) 3287 1114 or send us an email at sales@industrialtool.com.au.